Canterbury Cathedral is situated in the County of Kent in England, in what has become a World Heritage Site. The Cathedral is located within walled grounds together with ruins and medieval buildings. Of note is the Romanesque water tower, which was at one time the main water supply for the monastery. Parts of the bakery, brewery and granary are presently in use by the King's school. The original Quire was so badly burned in 1174 that it had to be rebuilt. Today's structure dates from 1180, when the restoration of the Quire was completed. The Corona was created as a separate shrine for part of Thomas Becket's skull, which may have been struck off during his assassination. In this part of the Cathedral there are many wonderful stained glass windows, which portray some of the miracles connected to St. Thomas. 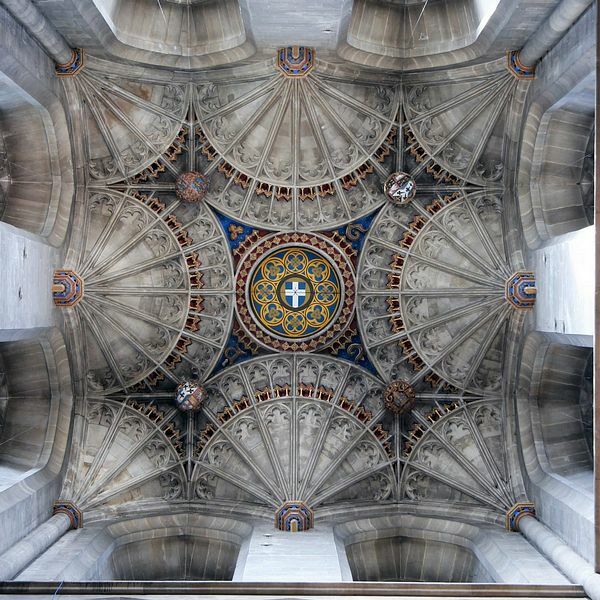 The Crypt built in Romanesque style is the oldest existing part of Canterbury Cathedral, dating from 11th century; it is the largest crypt from this time surviving in Britain. Still to be seen are wall paintings in St Gabriel's Chapel, decorated columns and carved capitals. The spot where Thomas Becket was murdered, is marked today by a contemporary memorial. Mounted above a bare stone alter are two rough edged steel swords and the point of a broken sword. Today this sacred place is still visited as much as it has always been throughout the centuries. small gardens, all of which are tended by five gardeners. The deanery and the other canonical gardens are not open to the public, except for the opening days of the National Gardens Scheme. The newest garden is the Herbarium or healing garden. 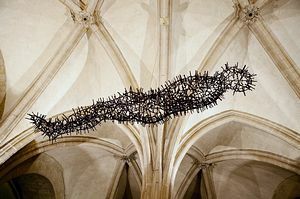 It has been created on the site close to the original Monastic Herbarium. The garden contains many of the plants which the monks themselves would have used to heal the sick and are still in use by today's herbalists. Canterbury Cathedral was founded in 597 AD by St. Augustine. Pope Gregory the Great sent Augustine from Rome, together with a group of Monks to England as missionaries to convert the Angles to Christianity. As what could be considered today as a 'home base' King Ethelbert, whose wife was already a Christian, granted St. Martin's Church to Augustine. St Martin's was a church during the Roman occupation of Britain and is still in use as a place of worship today. It is thought to be the oldest church in England. St Martin's is also part of the World Heritage Site. Augustine proceeded to build the first Cathedral, creating his 'seat' (derived from the Latin word for a seat 'cathedra') in this place and become the first Archbishop of Canterbury Cathedral. The Abbey of St. Peter and Paul was founded by Augustine: successive archbishops were buried here; it was later rededicated to St. Augustine. The Abbey today is part of the World Heritage Site, together with the Cathedral and the Church of St. Martin. The original Cathedral is no longer in existence; it lies beneath the nave of the present building. 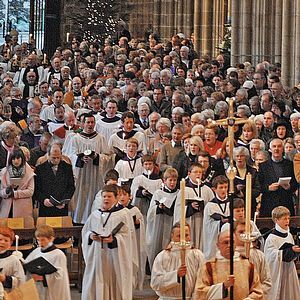 From early times a community formed around the Cathedral, these were mainly monks who offered up daily prayer and were considered to be part of the Archbishop's household. In the 10th century the community was formally recognised as a Monastery of Benedictine monks. This community survived until 1540 when King Henry VIII ordered the Dissolution of the Monasteries. Over the centuries the Cathedral suffered destruction and devastating fires. 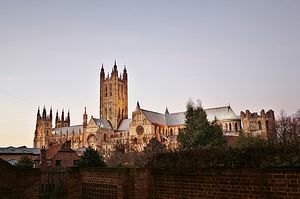 The Cathedral was rebuilt and extended by the Saxons. still be seen, there is a staircase and parts of the North wall remain in the area known as the Martyrdom. In 1162 King Henry II created Thomas Becket, Archbishop of Canterbury. Several disagreements took place between the King and the Archbishop, until in 1170 the King was heard to utter the immortal words "Who will rid me of this meddlesome priest?" Four Knights loyal to the King had overheard this and while Thomas Becket was in the Cathedral kneeling at prayer during Vespers, in burst the Knights who attached and mortally wounded Thomas Becket. 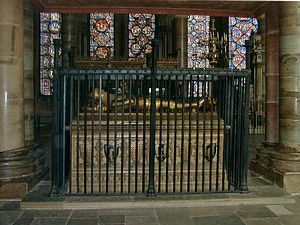 Thomas died in his Cathedral on 29th December 1170. It was thought that within a few days of his death, miracles began to take place. Windows known as the miracle windows in the Trinity Chapel illustrate the miracles and can still be seen today. 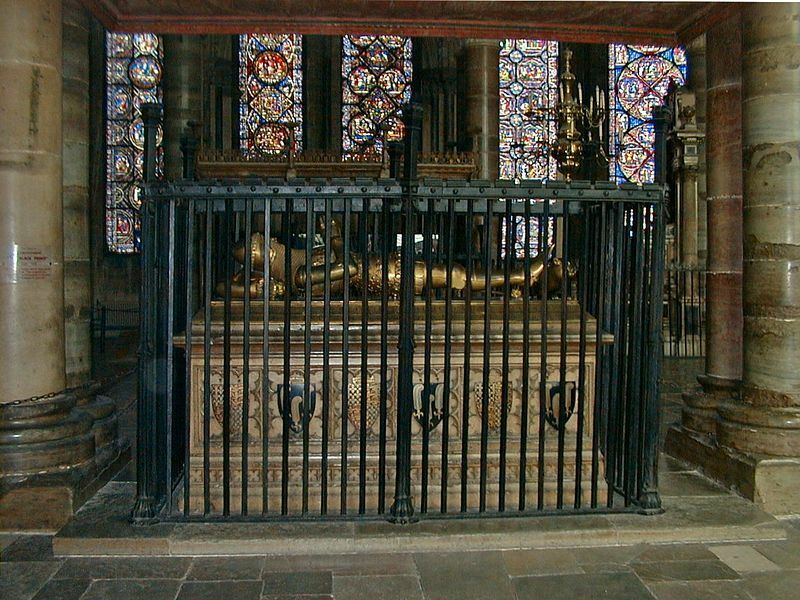 From this time onwards Pilgrims have visited Thomas Becket's shrine in Canterbury Cathedral. It was noted that a year later King Henry dressed in sackcloth and walking barefoot was one of the visiting pilgrims. the 1640s brought further vandalism to the Cathedral; many of the medieval stained glass windows were broken and the nave was used as a stable for the Puritan soldiers horses. After the Restoration in 1660 it took many years to renovate the building. By the 19th century the North West tower became unsafe and major work was required; it was dismantled in 1830 and was rebuilt with a copy of the South West tower, which gave the Cathedral a new balanced effect to the west end of the building. 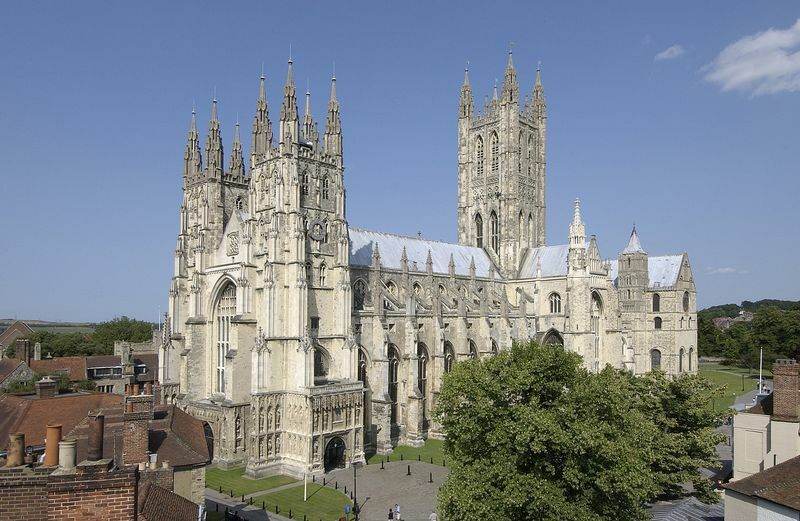 During World War II Canterbury was badly damaged by enemy aircraft and indeed the Cathedral did not escape. The library was destroyed, but due to the vigilant team of firewatchers who dealt with the incendiary bombs being dropped the main structure of the Cathedral was not badly damaged. Today Canterbury remains a place of worship, where visitors are very welcome to join in one of the regular services, or to join a tour of the building, or simply to find their own way around and absorb the peace and tranquillity of this very ancient and special building. Parts of the Cathedral may be open outside these hours. Please telephone the Visits Office before visiting to check the current opening times. There is a charge to enter the precincts and the Cathedral unless you are attending a Service. 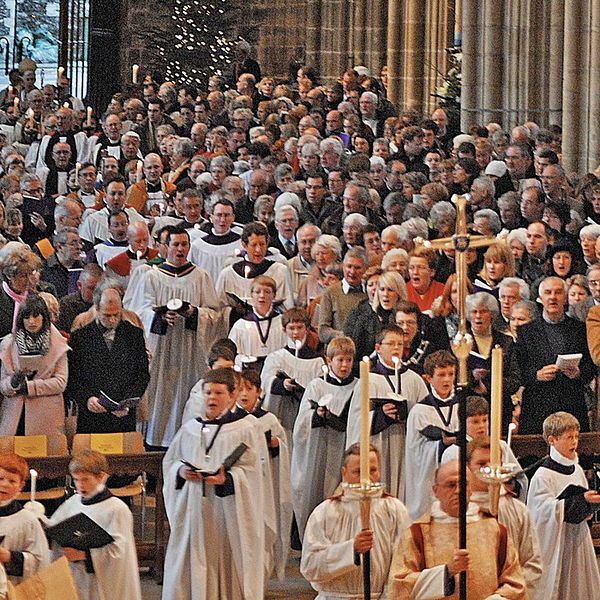 This charge is a contribution towards the upkeep of the Cathedral and its activities. UK tax payers may ‘Gift Aid’ their entrance fee which means that we can claim back 25% income tax. Your Gift Aid till ticket will then allow you free entry for 12 months. If you are not a UK tax payer, you can still enjoy 12 months free entry. Ask staff at the entrance gate for an 'Annual Ticket' form.